On 30 March 1997 residents in the S-flank settlement of San Vicente felt about six earthquakes between 0900 and 2100. One of these earthquakes took place at 1429; it was M 2.7 and its epicenter was 5 km SE of the volcano. No residents in other nearby settlements (Porvenir, Sucre, and Quesada) reported feeling these earthquakes. About 10 days after the earthquakes, two dry-tiltmeters, measured every 2-3 years, showed differing results. One showed great changes but had been disturbed; the other, which was considered more reliable, had changed little. An April 1980 seismic swarm near Platanar, attributed to a local fault, continued for 2-3 weeks. Information Contacts: E. Fernández, E. Duarte, V. Barboza, R. Van der Laat, E. Hernandez, M. Martinez, and R. Sáenz, Observatorio Vulcanológico y Sismológico de Costa Rica, Universidad Nacional (OVSICORI-UNA), Apartado 86, 3000 Heredia, Costa Rica. The Global Volcanism Program has no Weekly Reports available for Platanar. The following is from a cable received on 3 June. "New or increased fumarolic activity together with earth rumblings reported by municipal authorities at Cerro Platanar . . . . Although close to Quesada immediate area of volcano extremely inaccessible. Such activity appears to be unusual." Dry-tilt data have shown no significant changes since 1987. OVSICORI reported in January 1994 that two dry-tilt inclinometers installed in 1987 have thus far showed insignificant changes. The Platanar volcanic center is the NW-most volcano in the Cordillera Central of Costa Rica. The massive complex covers about 900 km2 and is dominated by two largely Pleistocene stratovolcanoes, Platanar and Porvenir. These volcanoes were constructed within the Pleistocene Chocosuela caldera, which may have formed during a major slope failure. 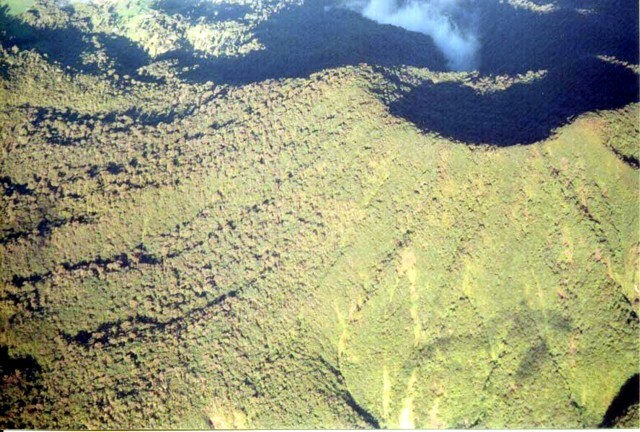 The Cerro Platanar volcano (known locally as Volcán Congo) on the N side of the complex has prehistorical lava flows on its W flanks and is the youngest volcanic center. 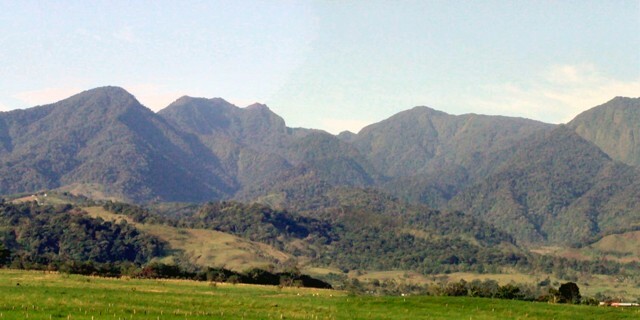 The highest peak is Porvenir, whose summit crater lies 3 km S of Platanar. A thin layer of phreatic ash suggested that an eruption from Platanar occurred within the past few thousand years (Stine and Banks, 1991). 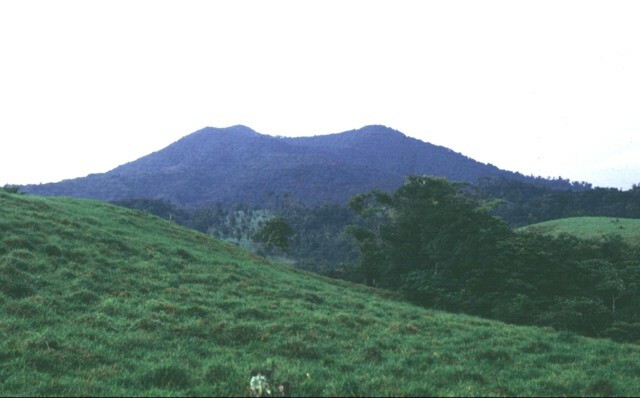 The Aguas Zarcas group of nine basaltic cinder cones, located on the N flank of the Platanar-Porvenir complex to as low as 160 m altitude is, in part, Holocene in age. Alvarado G E, Carr M J, 1993. The Platanar-Aguas Zarcas volcanic centers, Costa Rica: spatial-temporal association of Quaternary calc-alkaline and alkaline volcanism. Bull Volcanol, 55: 443-453. The Global Volcanism Program is not aware of any Holocene eruptions from Platanar. If this volcano has had large eruptions (VEI >= 4) prior to 10,000 years ago, information might be found on the Platanar page in the LaMEVE (Large Magnitude Explosive Volcanic Eruptions) database, a part of the Volcano Global Risk Identification and Analysis Project (VOGRIPA). There is no Deformation History data available for Platanar. There is no Emissions History data available for Platanar. The Platanar volcanic complex on the horizon is the NW-most volcano in the Cordillera Central of Costa Rica. The massive complex consists of two largely Pleistocene stratovolcanoes, Platanar and Porvenir, which grew within the Chocosuela caldera. The highest peak of the complex is 2267-m-high Porvenir volcano, whose summit crater contains a small cone. 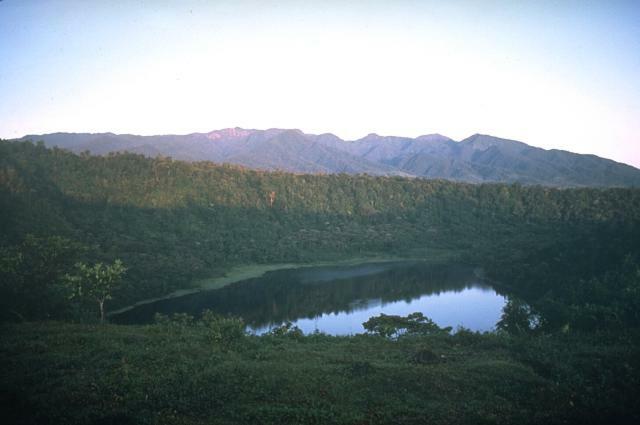 This view is from the east with the Bosque Alegre (Laguna Hule) maar, located on the lower northern flank of Poás volcano, in the foreground. Photo by Mike Carr, 1983 (Rutgers University). Platanar volcano, located NW of the more well-known Poás volcano, is part of the Juan Castro Blanco National Park. Volcán Platanar and Volcán Porvenir were constructed along a N-S line in the western part of the park within Chocosuela caldera, which formed as a result of major explosive eruptions during the late Pleistocene. The Aguas Zarcas group of nine basaltic cinder cones, located on the far northern flank of the Platanar-Porvenir complex to as low as 160 m altitude, is in part Holocene in age. These cones lie 10-17 km behind the volcanic front of Costa Rica at a point 125 km above the Wadati-Benioff zone. The pyroclastic cones were constructed along two parallel fractures striking NNW. The summit crater of 2183-m-high Platanar volcano lies in the shadow at the upper right in this aerial view from the south. Prehistorical lava flows are found on the western flank of Platanar. 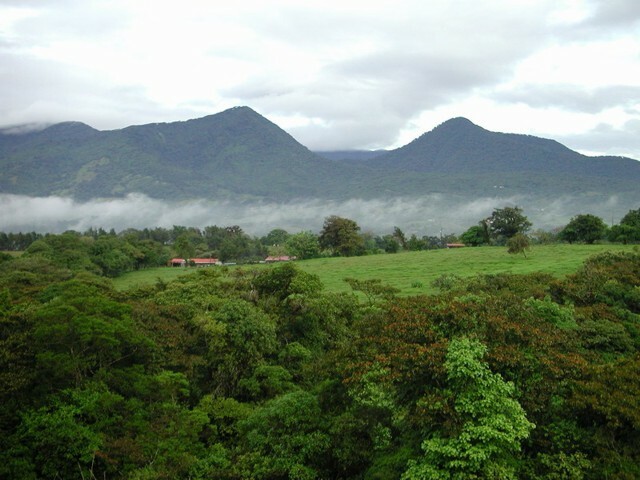 The forested slopes of Platanar and Porvenir volcano to the south are habitat to abundant wildlife, including jaguars, foxes, pacas, and red- and white-faced monkeys, as well as exotic bird species and tropical snakes. Tropical trees abound, including the cabbage palm, from which a local delicacy, the heart of palm, is extracted. Photo by Federico Chavarria Kopper, 2004. Volcán Platanar rises above farmlands north of the volcano. 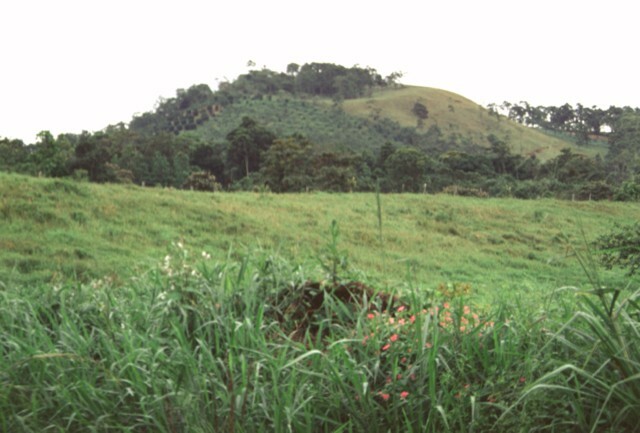 The summit of Platanar, which is also known as Cerro Congo, after the howler monkeys occupying its slopes, reaches 2183 m. This stratovolcano lies about 8 km SE of the city of Quesada at the northern end of the Palmira-Chocosuela-Platanar volcanic complex. Young lava flows are located in the Finca Pradera area on its western flank. The Viejo-Porvenir complex is seen here rising above farmlands NE of the massif. The 2122-m-high Volcan Viejo is on the left and 2267-m-high Porvenir on the right. Volcán Viejo is not actually a volcano, but lies along the rim of the Chocosuela caldera and the Río Segundo erosional caldera. El Viejo is noted for an area of sulfur deposits and fumarolic activity that was prominent until about 1960, after which it decreased and stopped by 1975. Porvenir is a small stratovolcano with a summit crater containing a pyroclastic cone. Large Eruptions of Platanar Information about large Quaternary eruptions (VEI >= 4) is cataloged in the Large Magnitude Explosive Volcanic Eruptions (LaMEVE) database of the Volcano Global Risk Identification and Analysis Project (VOGRIPA).